Before starting the manual USB creation process, you must download the .zip file that contains CloudReady. 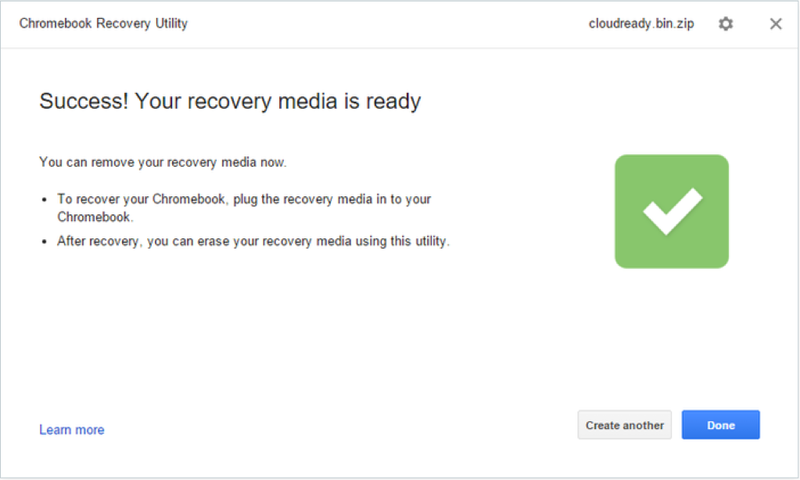 Start by downloading the CloudReady .zip file to your standard downloads folder, not a USB device. If you are a current CloudReady customer, or have already signed up for a trial, download the .zip file from my.neverware.com on the Downloads tab. You can start a 3 week trial of the Education or Enterprise Editions of CloudReady, totally free, by signing up at try.neverware.com. After signing up, you'll be able to download the .zip file from my.neverware.com. If you are an individual user and don't need support or management, download the .zip file for our free Home Edition here. This guide assumes that you have downloaded your image and that it is in your Downloads folder. The CloudReady file that you download is compressed in .zip format. Due to a bug in Mac OS, the CloudReady file must be unzipped using the free software called Unarchiver. If Unarchiver is not used, the USB installer creation process will fail. 1. Download the Unarchiver utility to allow you to correctly unzip the CloudReady installation file. You must use this software to unzip the CloudReady zip file. 2. Locate the Unarchiver zip file in your downloads folder. Click to unzip it, and then click on the icon to install. 3. 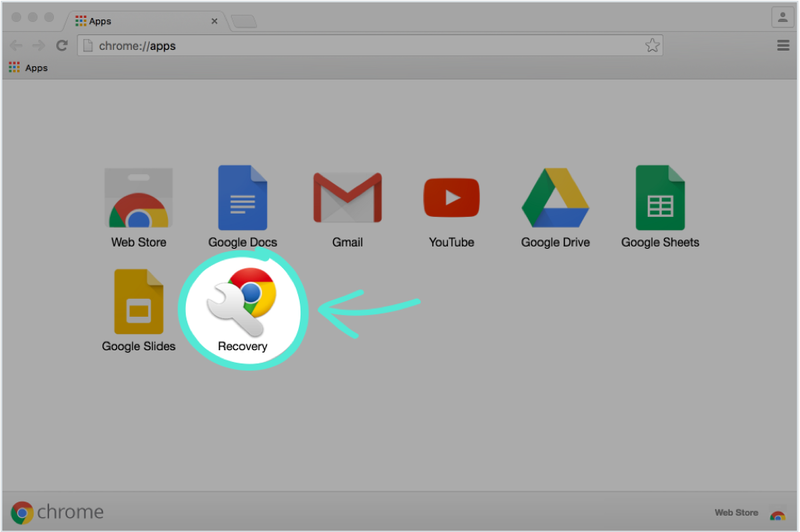 Locate the CloudReady file that you downloaded earlier, right click it, and selection "Open with" and then "The Unarchiver" option. 4. Once the file is extracted, the result will be a file ending in ".bin" extension. In the next steps, you will use the Chromebook Recovery Utility to turn the .bin file into a CloudReady USB installer. You must have this extension installed to create a CloudReady installer. 1. Locate the blue "Add to Chrome" button on the top right hand corner of the page. 2. 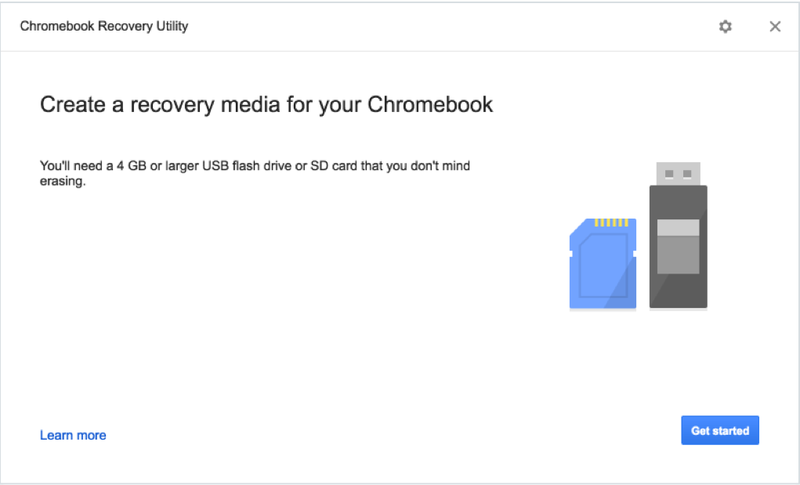 The Chromebook Recovery Utility will be installed in your browser, and will show up on the Apps Page. 1. Launch the app and click on the blue Get Started button. 2. Locate the gray gear icon on the top right of the window. 3. Click the gray gear icon and choose Use local image. 4. Locate the CloudReady .bin file that you extracted using Unarchiver, and follow the instructions on the screen. When prompted, insert your 8GB or 16GB USB flash drive. During the process, it is normal for the utility to show unusual percentages. 5. When the process is completed, remove the USB flash drive from your computer. 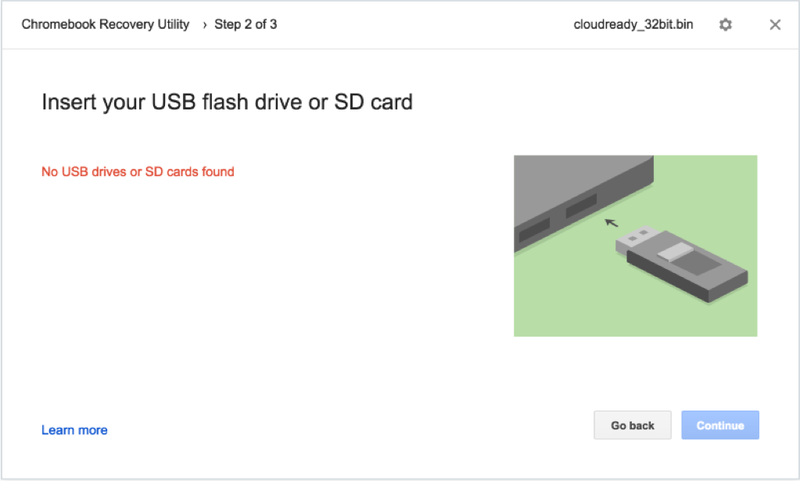 Your USB flash drive is now a CloudReady installer, and is ready to use!